FOR anyone who has been following Coventry since the amateur days, the festive season this term might feel a bit hollow. There's been a conspicuous absence of rugby. The last game was the drawn league fixture away at Nottingham on December 23. The next game comes next Saturday, January 12, a home clash with Doncaster Knights. That's a long lay off, which hopefully will have allowed some of the players a chance to recuperate and recharge the old batteries ahead of a key run of matches. Especially given the smattering of Premiership Rugby and the seemingly non-stop football matches. Coventry City played on December 22. They won an exciting Boxing Day clash against Charlton and were back in action days later, on December 29 to put one past Southend, before another winning performance on New Years' Day against Wycombe. Not a bad return for a festive fixture list, which sees the Sky Blues in action again tomorrow. Back in the day, the annual Boxing Day clash against Moseley was one to savour. Coventry and Moseley, keen foes in the best sense of rugby, a smattering of internationals on each side and always a point to prove. It's almost a different world now. Coundon Road and The Reddings gone. Moseley, now Birmingham Moseley. A proud club, like Coventry, which struggled to adapt to the professional age and slipped down the rankings. Now anybody who has been following the travails of Coventry Rugby over the last couple of decades will appreciate the great strides forward being made by the management team at Butts Park Arena. The pre-season fixtures were well organised and chosen, including Moseley, and November's Canada game proved a delight for all. But there's a bit of nostalgia for the brutal hits and hard running that typified the Boxing Day clash. Many who remember those days of yore have wondered on social media whether something couldn't have been arranged, even if it meant a run out for the development squad and fringe first team players. Except, and here's the rub, could a decent attendance have been guaranteed? Would it have been worth getting the players, the management team, and all the staff and volunteers that are needed for a home game at BPA out of bed? In the last home league fixture against the old foe, 2,100 turned up. 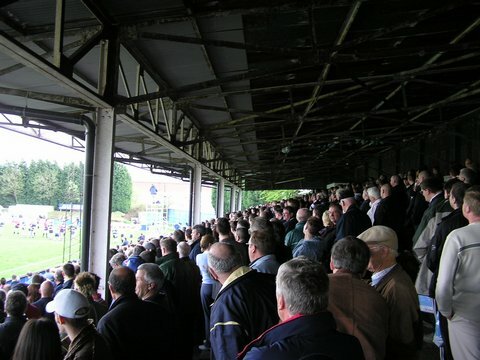 Coventry's travelling faithful helped fill Billesley Common, Birmingham Moseley's current ground, with a 2,096 attendance for the last league meeting. Not bad but not a patch on the days when standing room at Coundon Road was at a premium for the festive fixture. Lest we forget, the friendly organised for pre-season was a bit of a poor show from the fans, with just 1,204 watching Cov put Moseley to the sword in August. It was supposed to be an occasion to savour, the famous rivalry and the Harry Walker Memorial Cup up for grabs, honouring one of Cov's greats. The match itself didn't disappoint, especially for those following the blue and white, with 12 tries as Cov ran out 62-14 winners. But the attendance has to be one of the poorest in recent times. So maybe it would not have been worthwhile arranging a Boxing Day fixture, however fondly the older brigade remembers them. Moseley are in the relegation zone of National League One and attendances at Billesley Common average 646, just 13 per cent of capacity. Even if it suited Cov, would it have been good for Moseley? Would it have lived up to the occasion of past years? At least, for some, there are the memories. Edited 1 time(s). Last edit at 2019:01:12:18:54:37 by AdminBTCov.